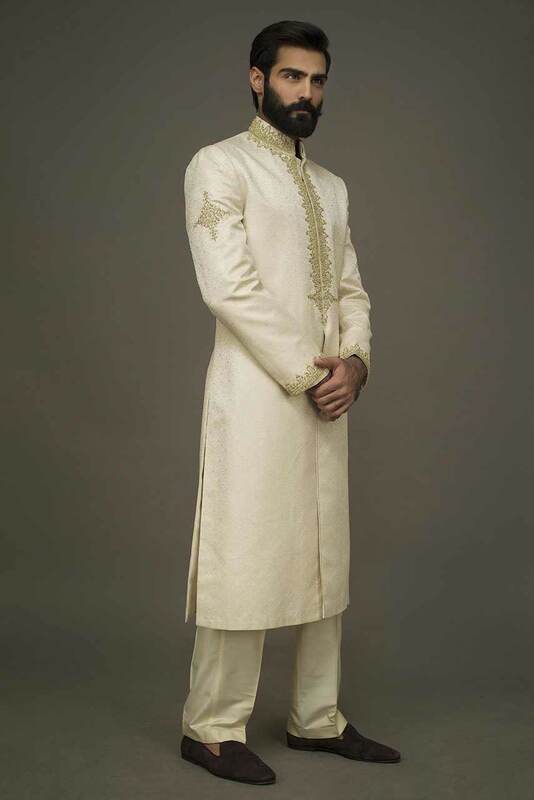 Let’s get ready for the latest wedding sherwani designs for mehndi function/ceremony. 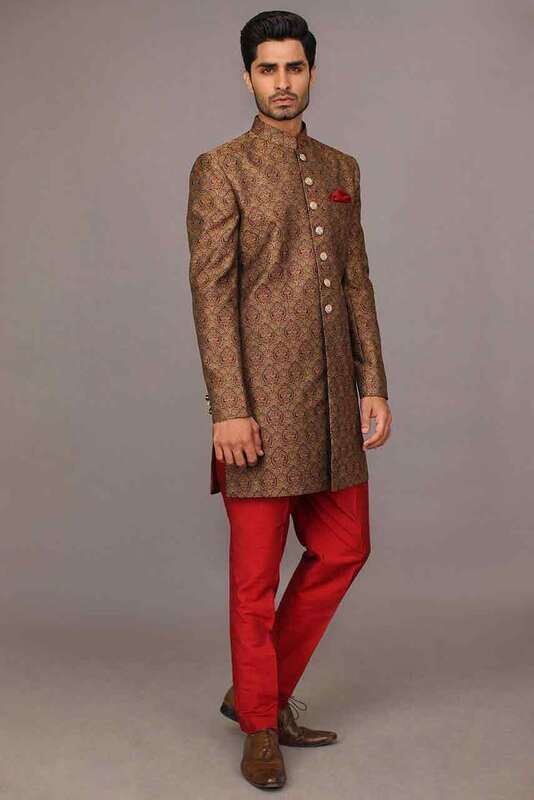 Mehndi kurta styles and trends comes together in all this groom wear masterpiece collection. 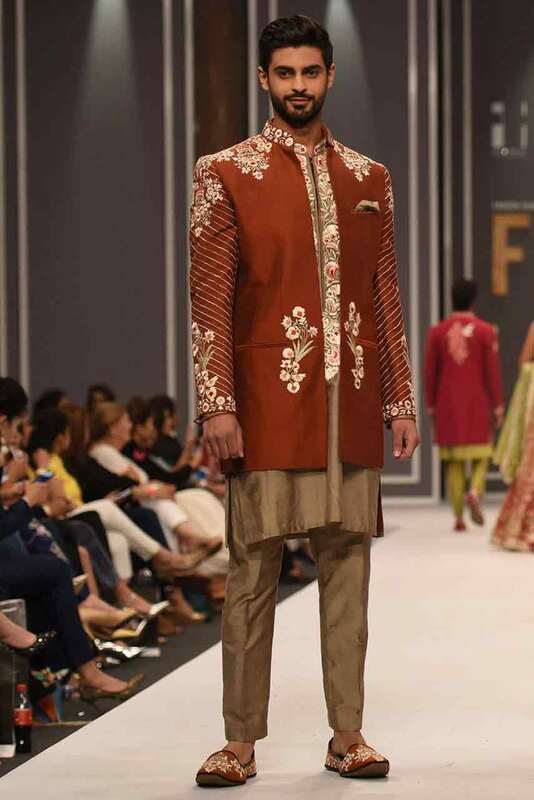 Either you are the groom or going to attend the mehndi wedding function, be the sunshine of everyone’s eye by wearing one of these super gorgeous top Pakistani designers mehndi dresses for groom. 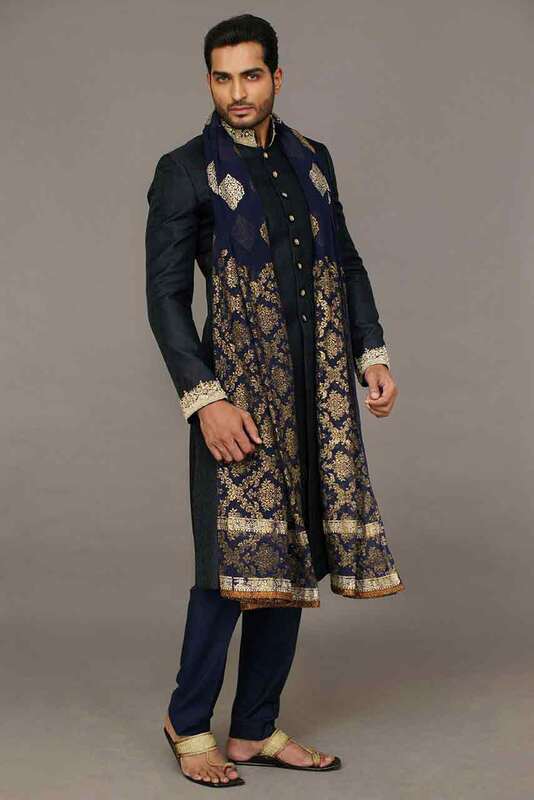 Rock the mehndi night with these ravishing traditional sherwani dresses that are perfect for the groom or his brother, father, cousin or even a friend. 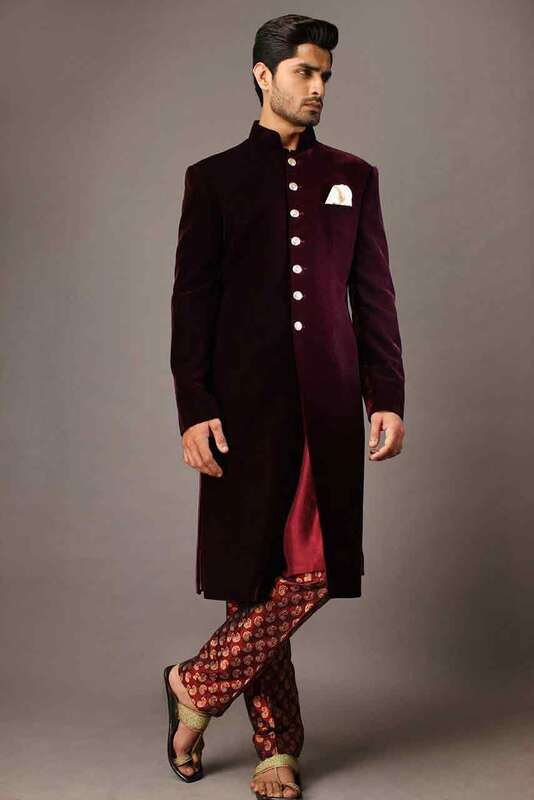 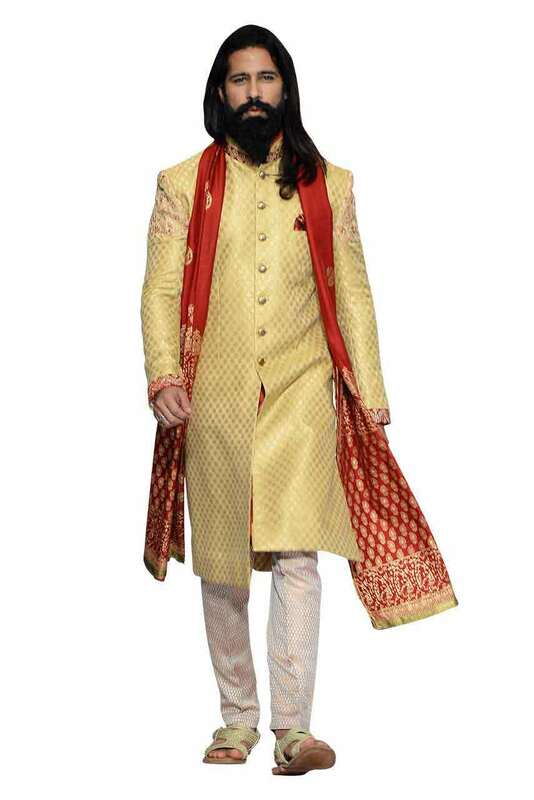 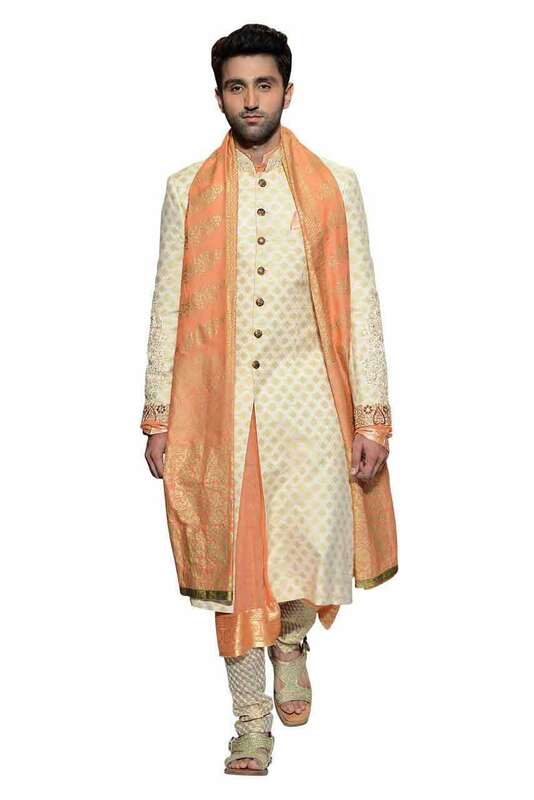 An alluring style sherwani, has always been reflected by the use of sensible colors and excellent design. 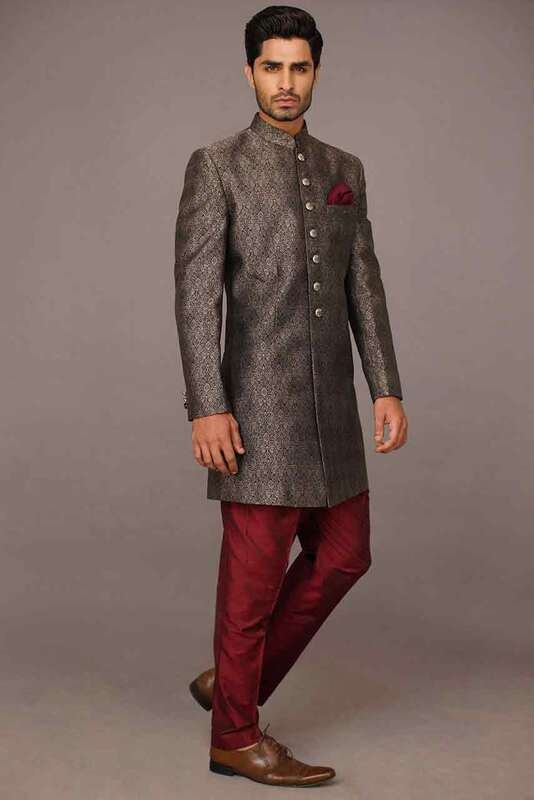 Here we have filtered the stunning and latest trends of groom sherwani, to add the glamour in your overall appearance. 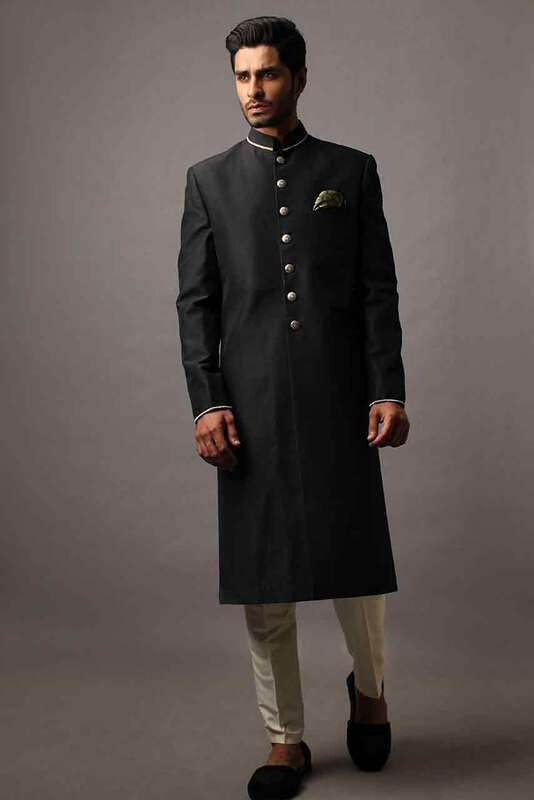 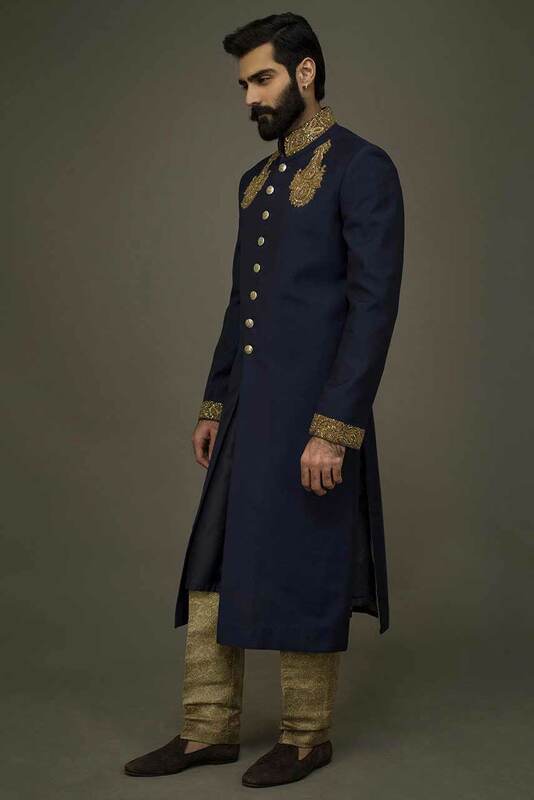 You can enhance your personality with these stylish sherwani dresses that comes in variant prices. 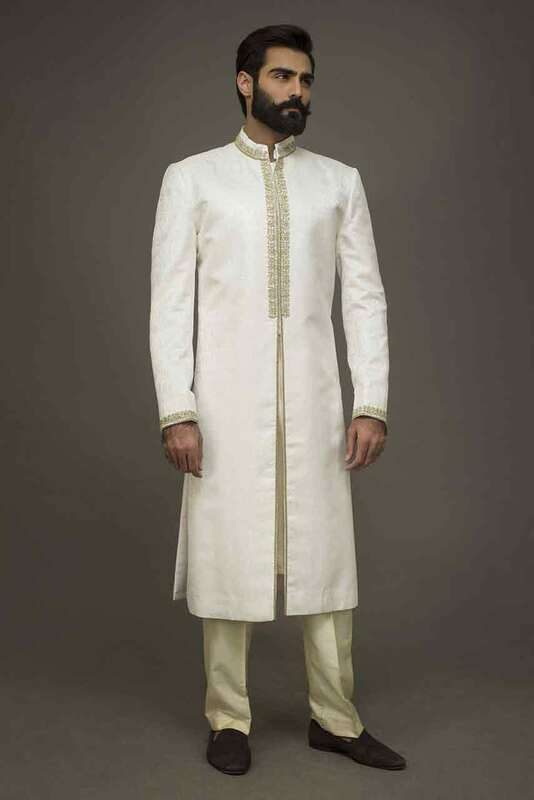 All of these sherwani styles are most luxurious thus they cost a little more expensive because of the designers’ goodwill and the extraordinary work on them. 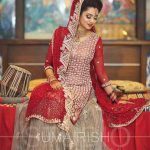 Latest fashion styles and trends will be at the peak of your beauty when you will wear one these beautiful attire for wedding function. 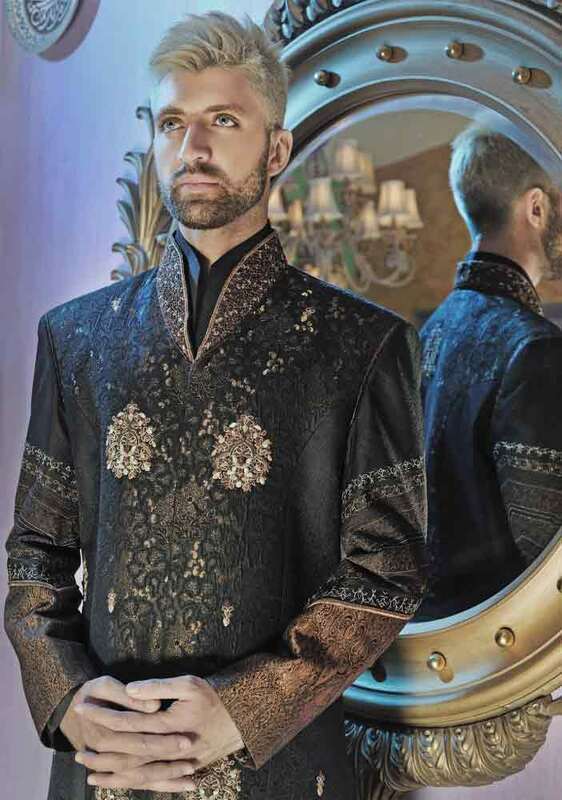 Today we have gathered the latest sherwani designs for mehndi function, from the most coveted Pakistani wedding wear brands. 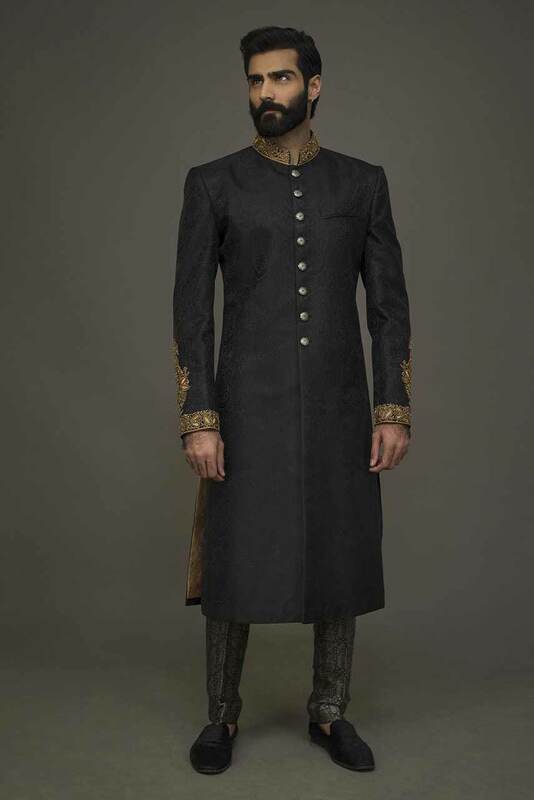 All of this stunning collection is uniquely crafted with embroidery work on front, back, shoulder and so on. 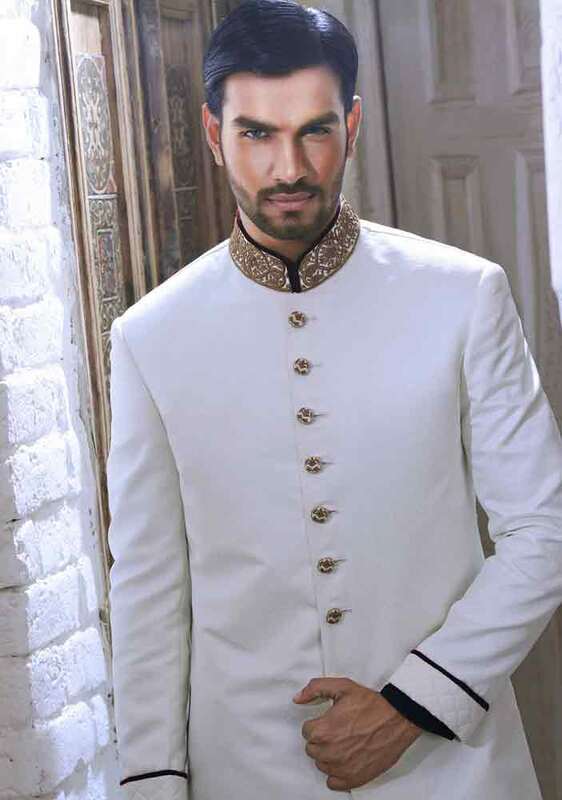 Add grace and charm to your appearance from the exclusive collection of best Pakistani designer sherwani. 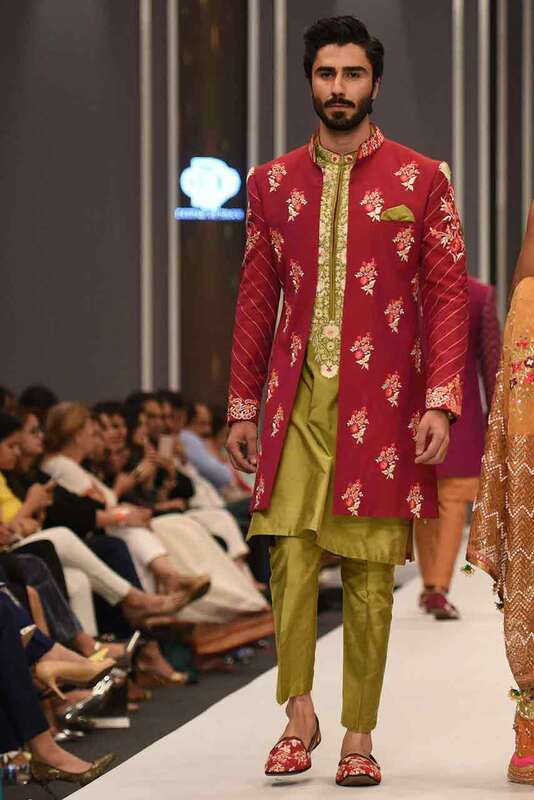 All these designs include the product articles of two best Pakistani designer brands that are Deepak Perwani and Amir Adnan. 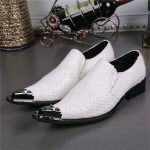 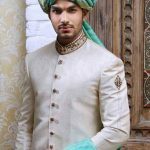 These designers provide each and every single detail regarding the Pakistani traditional sherwani designs with price for wedding. 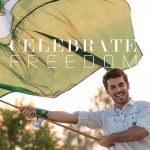 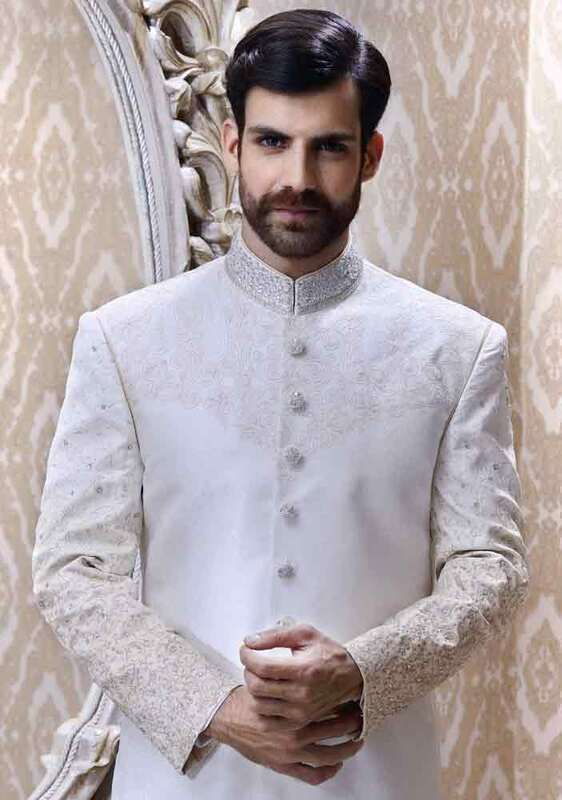 Deepak Perwani is one of the shinning names in Pakistani fashion industry just because of her breathtaking clothing range which includes fascinating groom wear to captivating trendy wedding dresses. 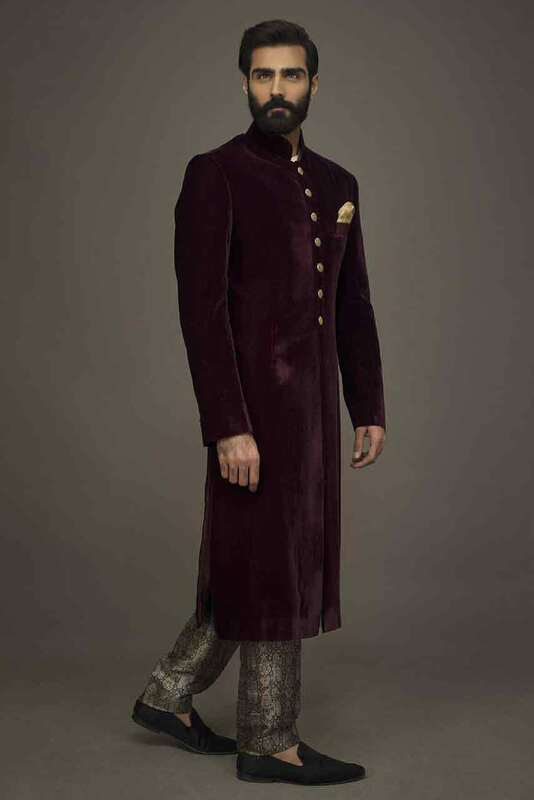 The use of luxuriant fabric in both bold and soft hue, is actually the reason that he has gained massive reputation all around the fashion industry of Pakistani wedding wear trends. 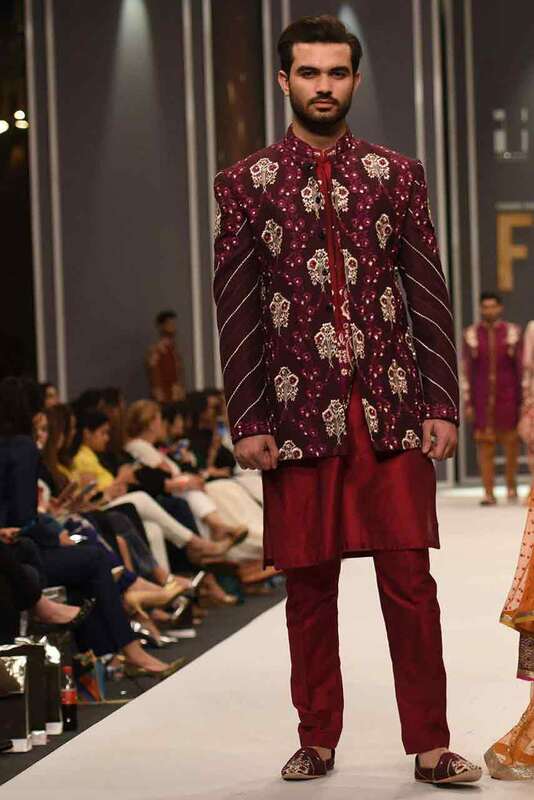 The Amir Adnan brand is best known for her luxurious and versatile prints with her extravagant heritage for the groom wear trends in Pakistan. 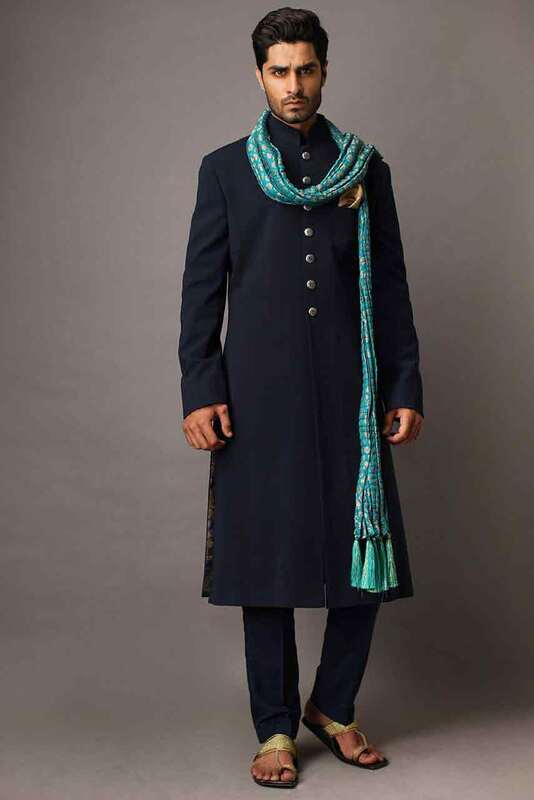 The use of pure fabric, embroidery, stitching, specialized prints and the fine craftsmanship indeed makes this designer a style icon in the fashion world. 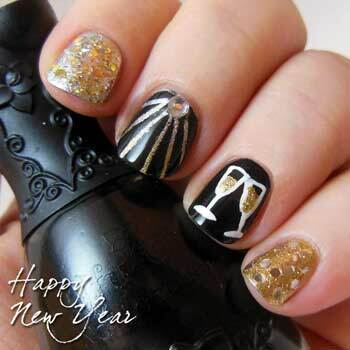 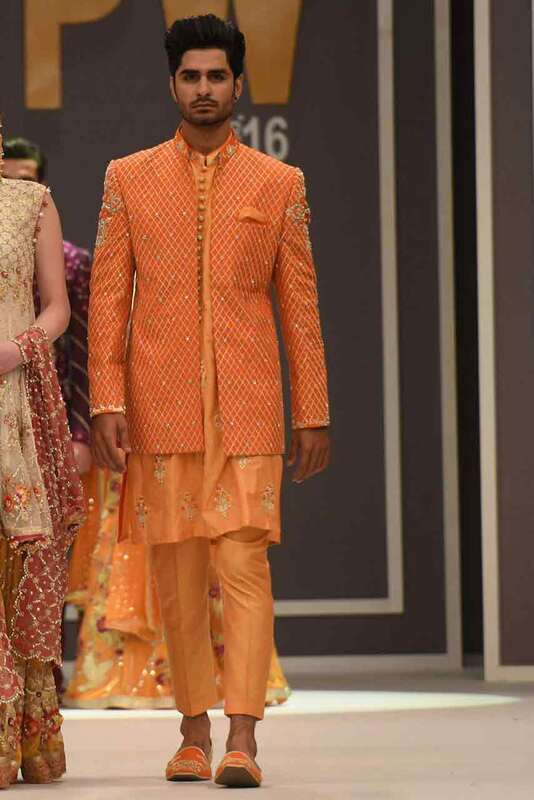 It has shown the remarkable and artistic skills consistently for the showcase at PFDC and FPW platforms in Pakistan. 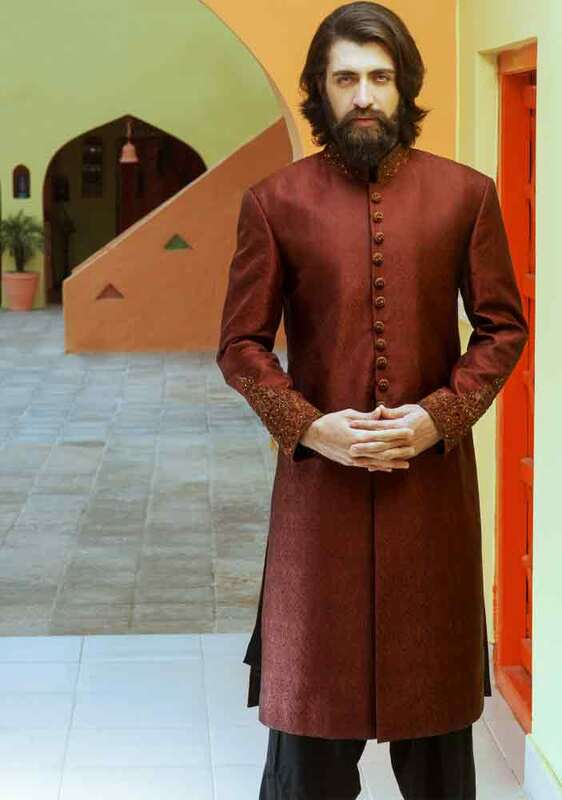 Recently, with the other products such as Amir Adnan kurta and latest shalwar kameez collection by Amir Adnan, the exclusive wedding sherwani collection for groom’s mehndi day function has also been unveiled. 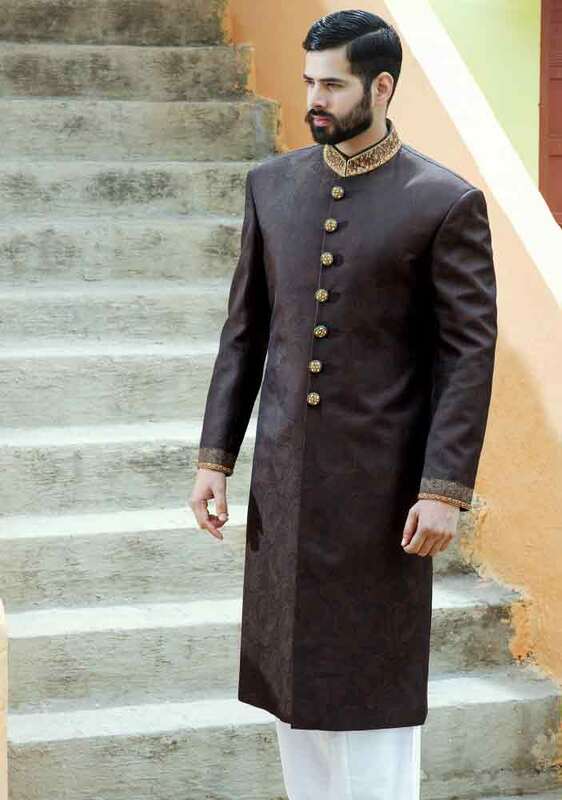 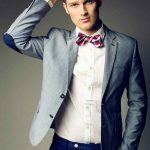 These are the top Pakistani groom wear designers who have got much popularity for introducing new Pakistani sherwani designs for mehndi function of wedding as well as for the upcoming parties. 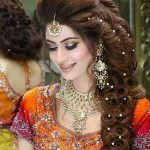 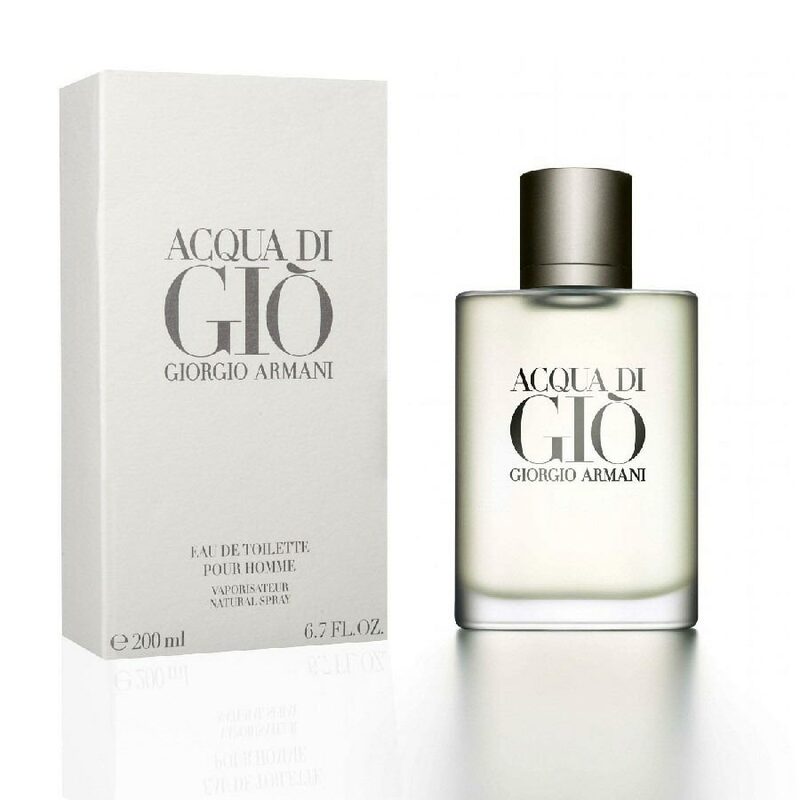 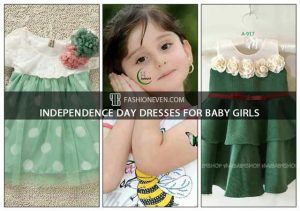 Both of these fashion industries have got plenty of opportunities not only in Pakistan, but also all around the international fashion world. 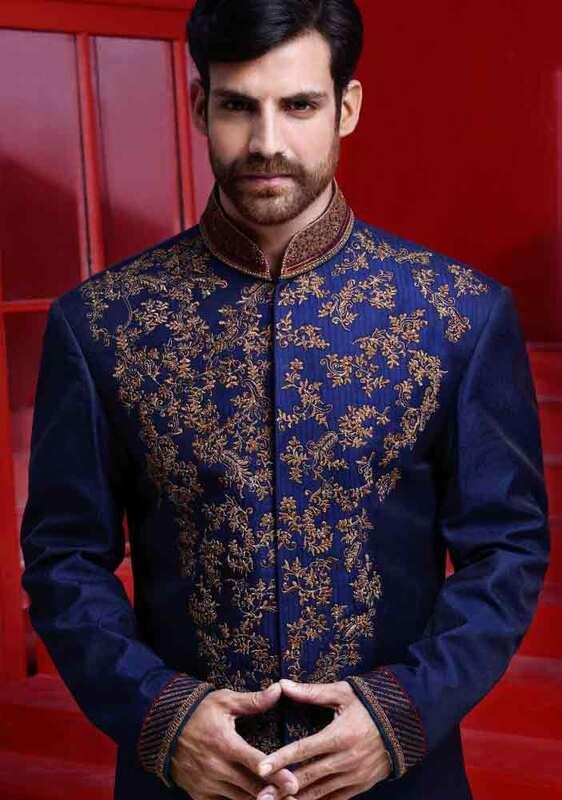 Latest sherwani designs in Pakistan are use to design with simplicity and a touch of soberness that makes them a masterpiece for the mehndi wedding function. 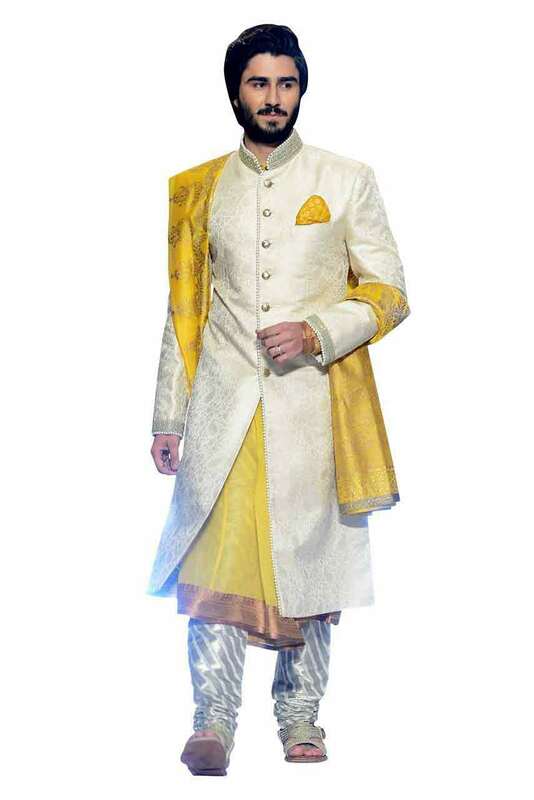 The color range which has been used for these beautiful traditional wedding groom sherwani designs is mostly green, blue, shimmery golden, white, cream, yellow, peach, black, orange and much more. 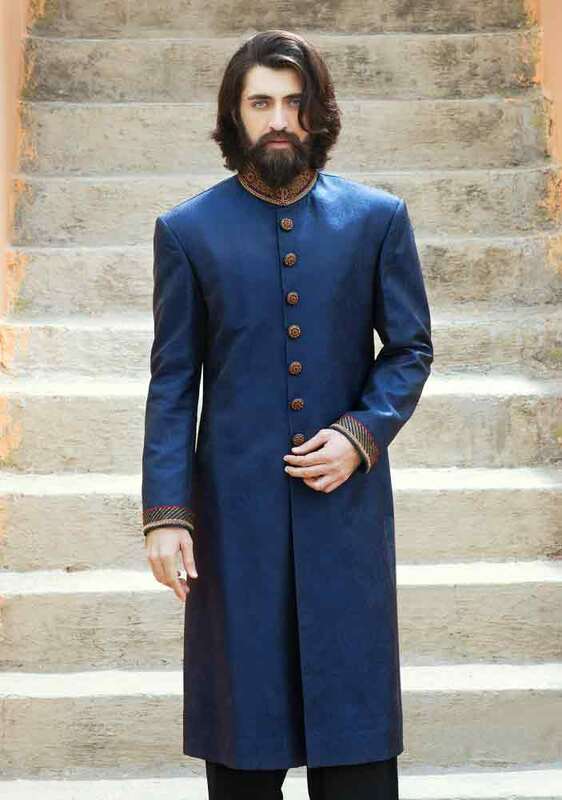 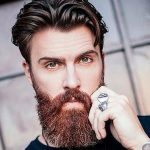 Here are the men’s beard fashion that will complement with all of these groom wedding sherwani styles. 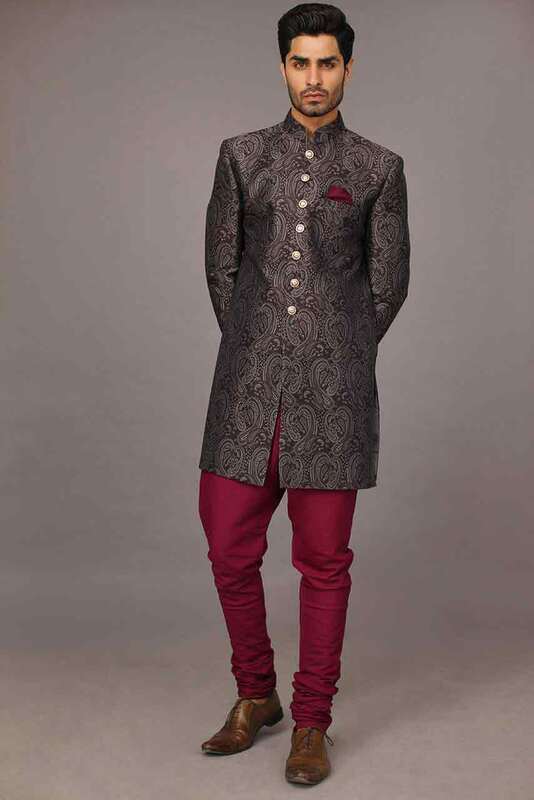 We hope that you must have got the dazzling ideas from the latest sherwani designs for mehndi function. 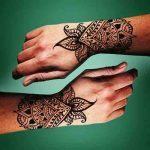 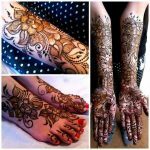 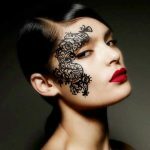 Grab your tremendous mehndi day attire today and create the significant influence of fashionista on everyone else around you. 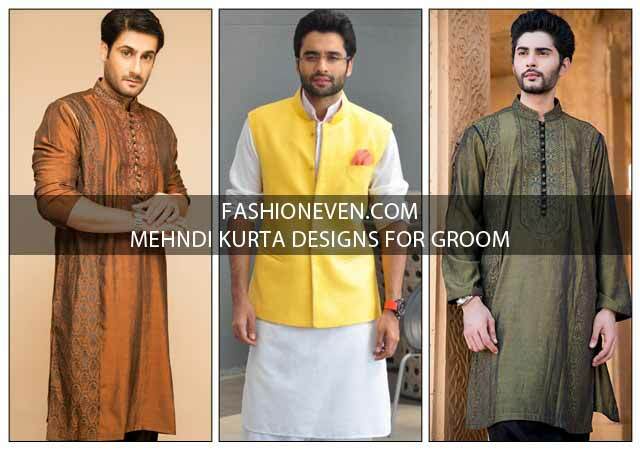 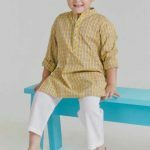 If you face any difficulty to get one of your favorite mehndi kurta styles from this latest collection then feel free to let us know via comments or contact us.